How philosophers and theorists can find new models for the creation, publication, and dissemination of knowledge, challenging the received ideas of originality, authorship, and the book. In Pirate Philosophy, Gary Hall considers whether the fight against the neoliberal corporatization of higher education in fact requires scholars to transform their own lives and labor. Is there a way for philosophers and theorists to act not just for or with the antiausterity and student protestors-"graduates without a future"-but in terms of their political struggles? 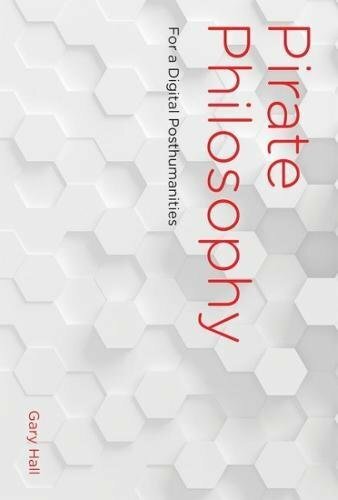 Drawing on such phenomena as peer-to-peer file sharing and anticopyright/pro-piracy movements, Hall explores how those in academia can move beyond finding new ways of thinking about the world to find instead new ways of being theorists and philosophers in the world. Hall describes the politics of online sharing, the battles against the current intellectual property regime, and the actions of Anonymous, LulzSec, Aaron Swartz, and others, and he explains Creative Commons and the open access, open source, and free software movements. But in the heart of the book he considers how, when it comes to scholarly ways of creating, performing, and sharing knowledge, philosophers and theorists can challenge not just the neoliberal model of the entrepreneurial academic but also the traditional humanist model with its received ideas of proprietorial authorship, the book, originality, fixity, and the finished object. In other words, can scholars and students today become something like pirate philosophers?